Floor Prepared with self leveling concrete, redguard and medium bed mortar. One long day of work. 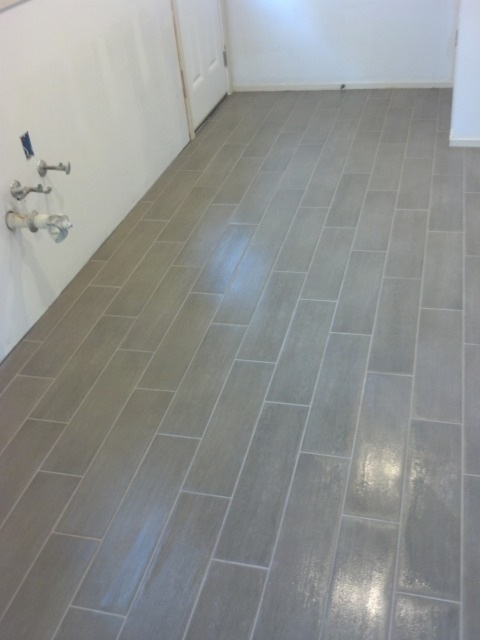 All tile back-buttered and set perfectly to chalk lines. 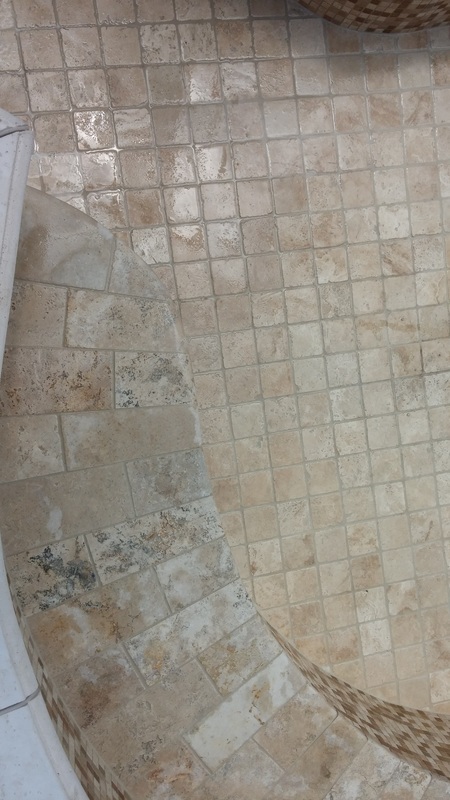 This 800 sqft condo was completely re-tiled with 2nd grade travertine. 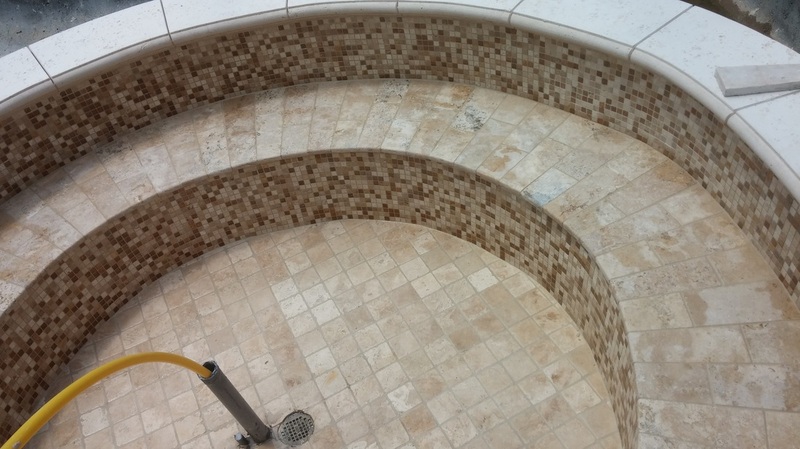 The floor was first treated with redgurad anti fracture membrane and then travertine was installed with modified thinset on both the floor and by back-buttering the tile to be sure to fill any holes in the stone to provide more strength when cured. 4" matching base was installed in place of baseboard to provide an elegant look. The lineal transitions of the base were all caulked with matching silicone grout to prevent cracking and provide proper expansion joint around the perimeter. Tiled Condo 12" & 20"
Tile is the perfect choice for ocean front condos. With a liquid applied membrane and quality thinset extreme abuse is the only thing that can damage the floor, and even then, chipped or cracked tiles caused by abuse are a cheap easy fix in comparison to other floor covering choices. The potential for water leaks is very high in condos with many connecting units and a flooding will not effect a properly installed tile floor on reinforced concrete. Anyone who is interested in having a wood floor in there home should first consider installing a porcelain plank tile instead. They require less maintenance, are more scratch resistant and are easier to repair if they are damaged. They are a great choice for vacation homes because the temperature and humidity does not need to be regulated unlike wood floors that can fail when homes are not climate controlled. 1000sqft of oak plank tile was installed in this condo. Layout is important. 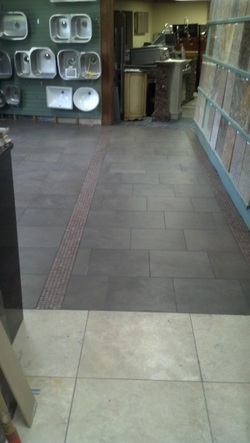 This floor was installed so that the transition at the door way was a full tile. Large format tiles are often crowned in the middle. Backbuttering each tile with thinset gives full support under the tiles and will help prevent chipping and cracking. 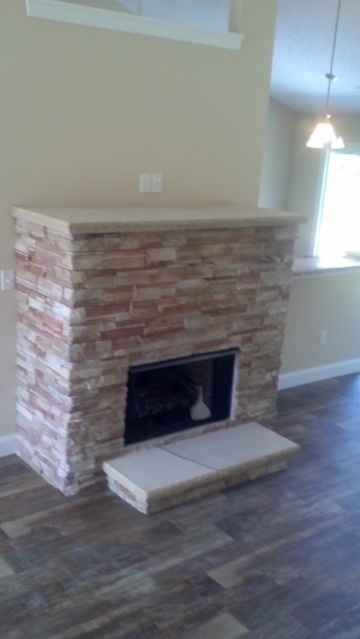 Dry stack fireplace with sandstone hearth and mantle. 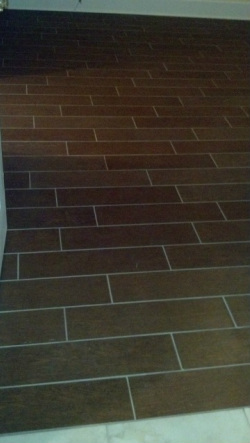 This italian made plank tile was installed in a beautiful ocean front house. The floor was constructed with a 24" O.C. truss system. 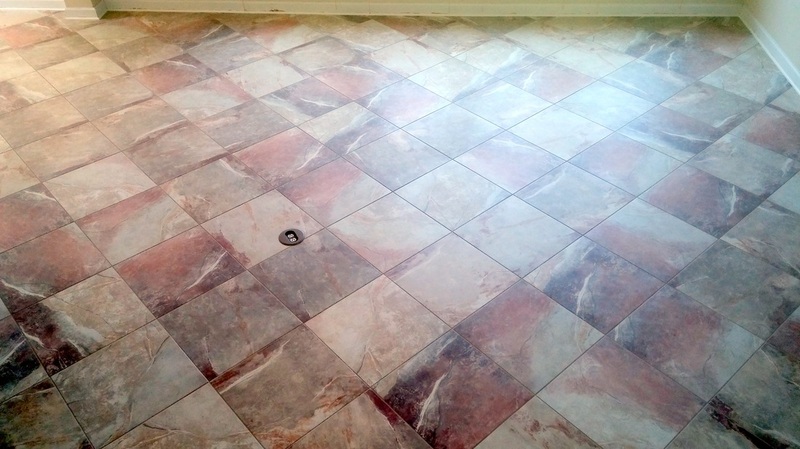 FOr tile to be installed, MDF plywood was removed exposing original subfloor. Peaks in subfloor where plained and new 1/2" plywood was installed. DItra uncoupling mat was then installed and 600sqft of plank tile with fusion pro grout was installed on first floor of house. This lifetime installation looks better then real wood and requires NO maintenance! 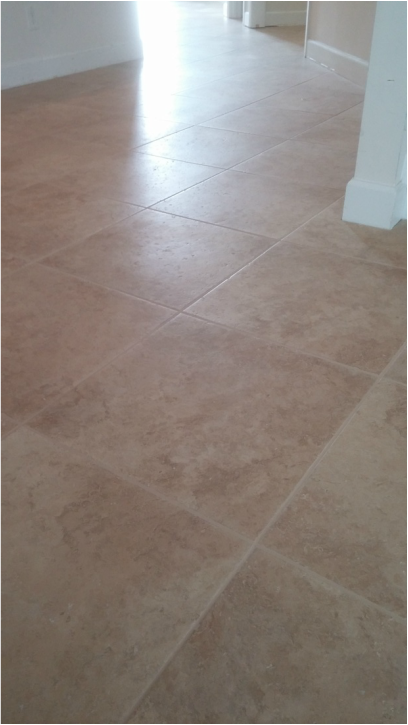 The floor in this condo had to be ground down in spots to allow for a flat lippage free installation of this 12x24 rectified tile. Anti-fracture guard was installed. Lot of time was spent selecting the right tile for the right place to match up the veins in the tile. 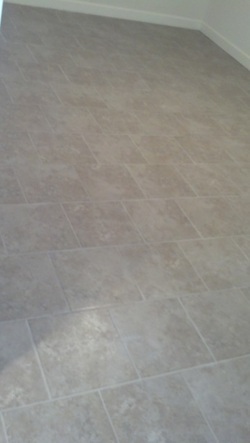 Tile was spaced only 1/16" apart and a leveling system was used to get a perfectly flat floor. Fusion pro stain free grout was then installed. This compass was designed and cut with a wet saw on site to be used as a subtle entry way detail. 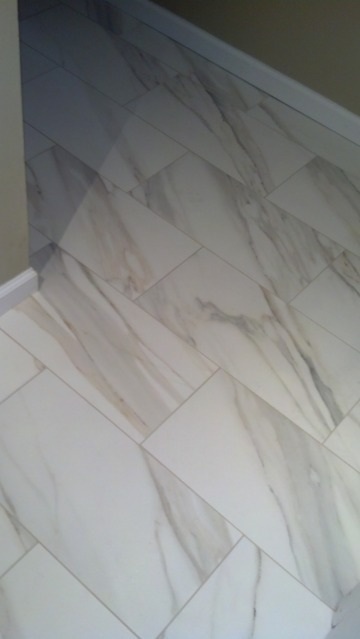 Marble can stain and scratch easily, and is typically more expensive then ceramic tile, but often times the beauty is well worth the extra maintance. Using a good sealer is always important with natural stone. 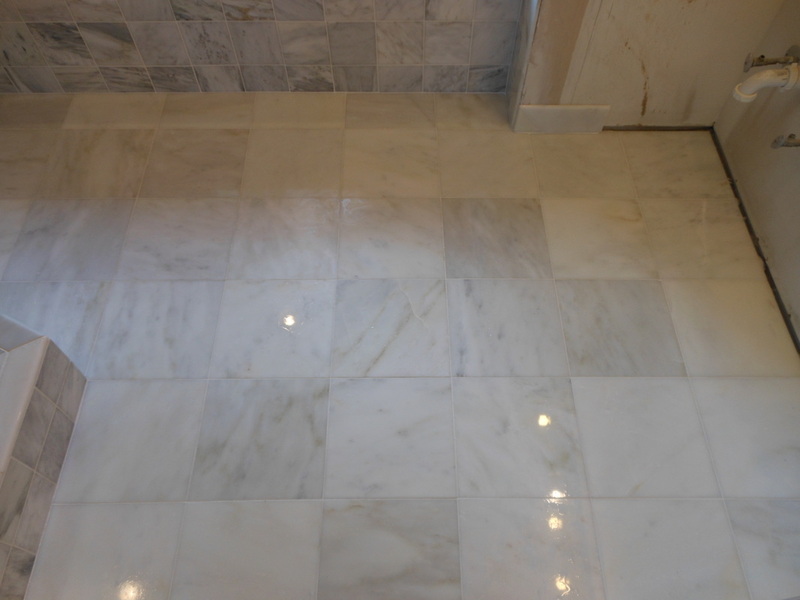 Another marble bathroom floor. Installation over 2 layers of plywood and ditra provided a very flat installation. 12x12 tile are spaced 1/16" apart. This rug features a double slate boarder. Slate comes in many different varieties. The outside boarder is tumbled slate which has a glossy look. The great thing about using natural stone is that each piece is unique. 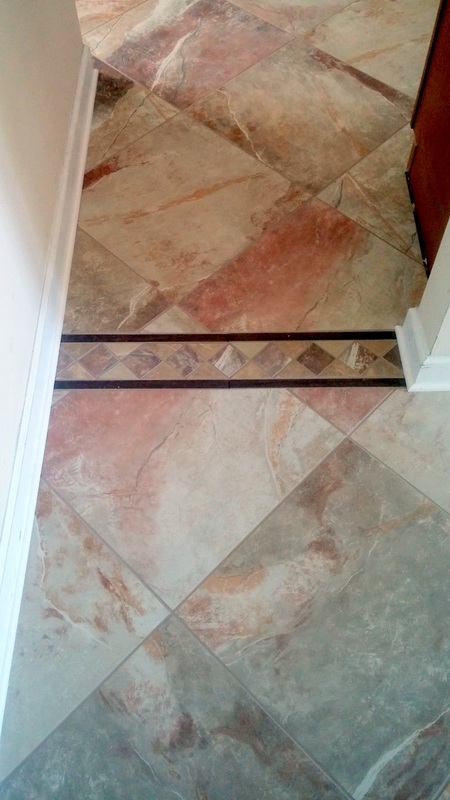 12" tile where precisely cut on the wet saw to provide this interesting hallway layout. 18" Porcelain over slab treated with liquid anti-fracture membrane with tiled hearth and wall with matching 2x2" mosaic tile and bullnose. New 3 1/4" baseboard was installed. This condo was tiled throughout the living room, kitchen and hallway with 12" and 6" rialto tile. Like many 3 story condos in myrtle beach, this condo has gypcrete floors to aid in sound and fire isolation. Gypcrete and cement to not bond well together and expand and contract at different rates. For this installation the floor was first primed and then 2 coats of liquid anti-fracture membrane where rolled on to provide a suitable tiling surface. This layout can help disguise a room that is oddly shaped or out of square since the joints are offset. Floor was preped with antifracture membrane to prevent small hairline crack in slab from transfering to tile. A non-sag thinset was used on the floor and wall. Glass border was installed with 11 insets centered in middle. To tie the floor into the wall, 12x5" tile set square to the room create a border for the floor and the wall that are on a 45. This beautiful porcelain has many different shade varieties and resembles natural stone. Existing tile was removed and then old thinset was chipped and ground away before redguard was applied to floor. Each tile was back-buttered to ensure 100% mortar coverage was achieved. 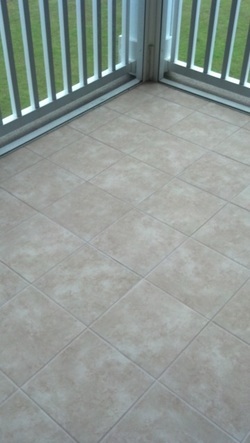 Cheap tile and carpet was removed from this new condo in cherry grove and was replaced with wall to wall tile. It is the perfect choise for a rental unit. A 12x12 was set in a brickjoint pattern. Inexpensive ceramic tile has a tendency to have inconsistencies in size and planeness. 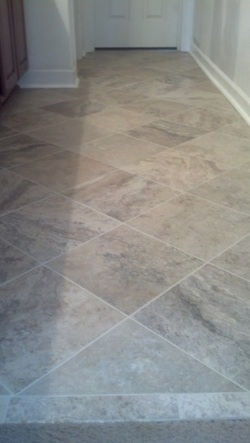 Most porcelain tile are consistent enough to space the tile close together. 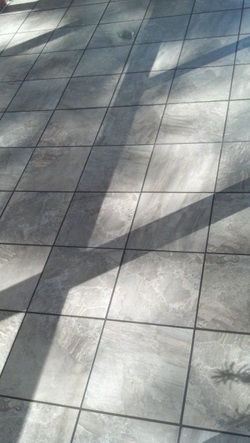 This provides a thin grout line which is often preferred. This patio had an expansion joint running down the middle. Since it is exposed to direct sun, a anti-fracture membrane was used and then a grout matching caulk was used to fill the joint over the expansion joint. 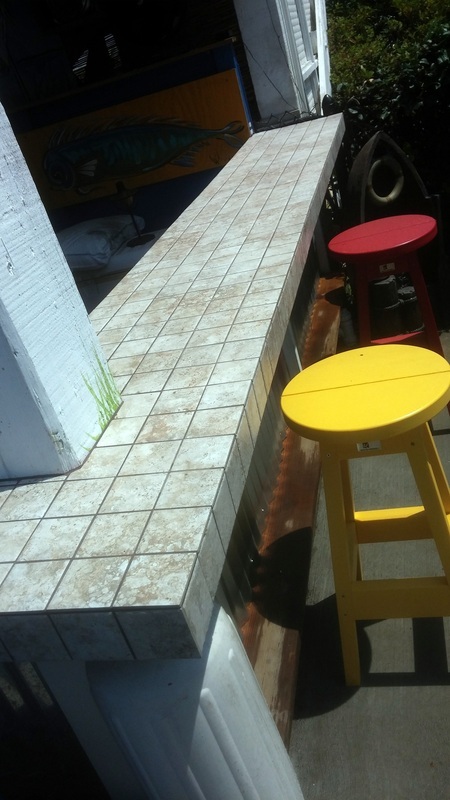 Porcelain tile is ideal for exterior installations because it is nearly impervious to water. Ceramic tile however does have a tendency to absorbs water and during freeze/thaw cycles may debond. Adding a small section of tile at the front door not only looks great but can take the stress of a high traffic area much better then wood or laminate. These 2x6 tiles are installed in a herringbone patteren. An oak transition piece was stained to match the laminate. Commercial bathrooms can get alot of abuse. Both mens and womens room where preped with Tec hydoflex for its antifracture capabilities. To insure a long lasting installation all tile where backbuttered. 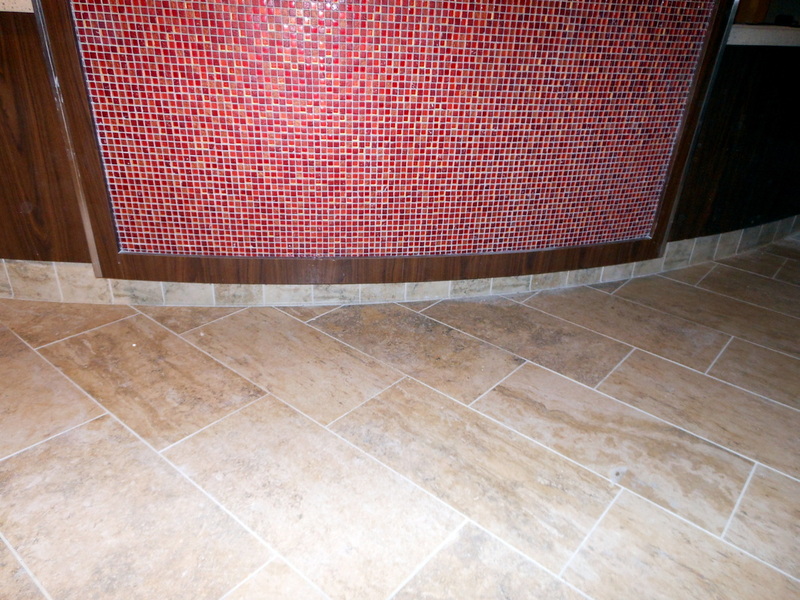 Adding tile to the wall in a commercial setting can make cleaning much easier. As always, floor to wall and corner transitions are caulked instead of grouted to prevent cracking. Tec XT grout with sealer mixed in was used to prevent the need of going back after grout was cured to seal. 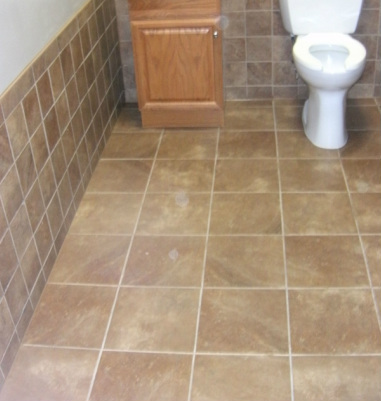 8x8" floor tile and 4 1/4" wall tile provide a low maintenance installation for high traffic bathrooms. There are many options for installing tile over plywood. A product called ditra was used in this bathroom. It is installed over plywood using modified thin-set and is then ready to be tiled on. The advantages of this product are that it uncouples the plywood and the tile, therefore movement in the plywood has less of a chance of affecting the tile. It also protects the plywood from any water damage that may occur which makes it a great choice for bathrooms. 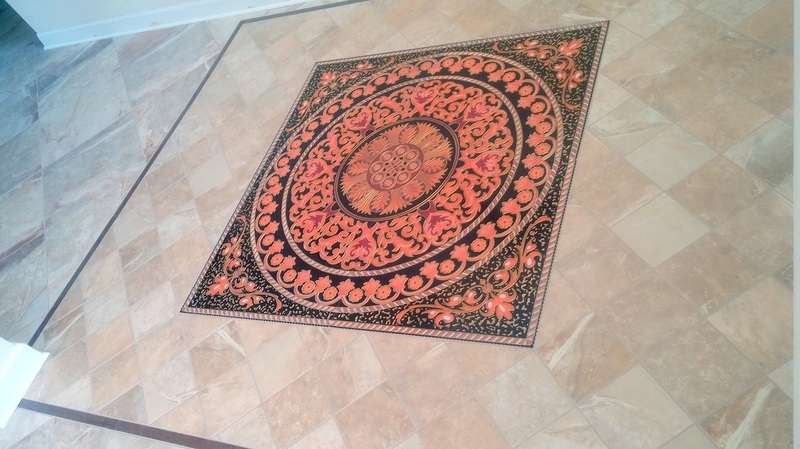 Adding tile at the main entry way is not only beautiful but also can be a cleaner solution then carpet or wood. 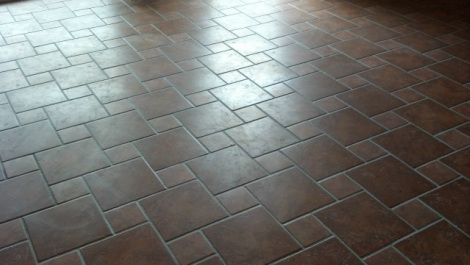 Around the perimeter of the tile, against the wall, it is important to leave the area void of any grout. This gives room for expansion. Molding is then typically installed on top of the tile to hide the empty void. For this project the baseboard was old and rather then painting it, tile was installed on the wall and then the transition joint was caulked. This can also be a good way to use tile left over from cuts. Tile was centered in bathroom and 8 insets are set in X patteren in the middle. Installation was over plywood and ditra uncoupling membrane. Because of the length of this kitchen, 12" tile set in a standard centered grid pattern provided the best layout possible. A few cracks where present in this slab and where treated with a sheet mebrane to isolate the tile. Redguard anti-fracture membrane was used on the rest of the floor to insure a crack free installation. Tile is perfect for kitchens. It is easy to clean and can withstand years of use and abuse. This basic "rug layout" was utilized to make use of 2 leftover lots of tile that alone where not enough to cover the floor. I prefer to only do this pattern with stone, rectified porcelain, and ceramic tile 13" or smaller. Warping that occurs during the firing process can make larger format ceramic tiles prone to lipage when installed in this manner. This bathroom floor was composed of 2 sheets of plywood with 1/4" backer board mortared and screwed to provide an adequate surface for tiling. Travertine is a natural stone. It is inexpensive and comes in many different shades. This medallion was made with leftovers to break up an otherwise basic ceramic floor. Tile is not the most common coutertop surface but it can provide more personality then laminates. It is typically about half the price as solid surface counters and can even rival laminates in price. Porcelain was used in this project because of its low price, durability and ability to resist staining and absorbing liquid. Adding tile to this patio changed the entire atmosphere of the backyard. Often times on a large exterior concrete pads like this one, control joints are sawed to prevent the concrete from cracking. These joints need to be treated with a membrane as they are prone to movement which can crack the grout and possibly the tile as well. Adding a membrane to concrete can help prevent minerals from the concrete being re-deposited on the grout. This is known as efflorescence. On an exterior application it is essential to seal the grout well and often to prevent water from entering and cause mildew to form in the grout joints. Mud or dry pack is a combination of sand, cement and a little water. It can be used for many applications but is most often used for shower pans because it can be sloped. It can also be used to make a perfectly flat and level floor. It is a skill many younger tile installers don't get to learn because of the many products that have been introduced that replace the need for mud like kerdi kits, cementboard and self leveling concrete. There are situations that mud is the only solution such as gang showers. Sometimes it can be cheaper to mud an unlevel floor then to use expensive self leveling compounds. This shower was constructed of just mortar and metal lath to provide a perfectly flat and plumb tiling surface. Without the need to pour a slab, pavers can be an inexpensive way to extend your patio. This kitchen features a custom made transition. 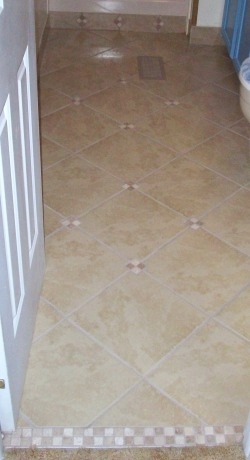 This border although simple, looks much better then just a full piece of tile at the entry into the room. This was the first floor I ever installed by myself.